The Monday before Christmas I was on my way to meet M2 for afternoon tea at the Sorrento Hotel. I try to make it there every year for the festive afternoon ritual. I was really looking forward to this year, especially since M2 is about to pack up and move south to sunnier climes so it might be our last chance to enjoy it together. But in the blink of an eye plans can change. A few blocks from the hotel a woman ran a red light and plowed into my car. Luckily neither of us was seriously hurt but by the time the police had filled out their reports, the tow truck had hauled my car to the body shop and M2 had ferried me here and there tea was no longer being served. We decided to try to salvage the afternoon by stopping somewhere between where we were and my house, since she was also going to drop me at my house. We were driving through downtown and had a couple places in mind when we passed by Mistral Kitchen. Although I knew it had opened a couple weeks ago it was not quite in the location I expected. Technically they are in South Lake Union but really just north of the main downtown corridor. So making lemonade from lemons we jumped at the chance to check out this new incarnation of Mistral, the former prix fixe dinner house owned and under the creative direction of chef William Belickis. Perched on the corner of Westlake and 8th it’s a warm, welcoming and rather long space with the bar and lounge anchoring one end and the restaurant seating the other, all pulled together by the open kitchen at the back. We settled in at the bar to check out the Happy Hour menu. I am sorry to say that I don’t remember Happy Hour details, I was a bit more discombobulated that night than I thought, and it’s not yet available online but I do remember there are both food and drink specials. M2 ordered a lemon-lime concoction and I started with a glass of Happy Hour red wine. And then we discussed and strategized what we’d select from the food menu. Lots of interesting sounding plates tempted us! We started with Macadamia brittle which, looking back, was an odd place to start, but we loved it. It’s amazing how swapping macadamias for peanuts takes this traditional candy and elevates it to a whole new level. But this menu item would best be enjoyed as a dessert not an appetizer so after our first couple bites we held off for the rest of our order. We both love charcuterie and so that was a no-brainer choice for us. M2 suggested the cheese plate, too. Once we ordered these items we realized we really needed something that was totally prepared there, not just assembled by the kitchen so we also added Branzino to the mix. 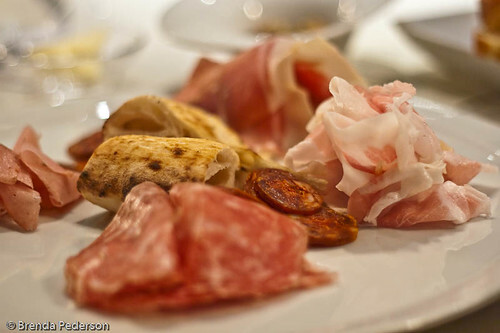 The charcuterie platter had a nice selection of five meats including chorizo, soprasotta, prosciutto. There were also a couple pieces of baked pizza dough on the plate. The kitchen is working on perfecting their dough so their tests are showing up as little bonuses here and there. The meats were delicious, but as you know I believe you really can’t go wrong with charcuterie. The sample pizza crust makes me look forward to ordering pizza there in the future. The cheese platter had a nice selection of three cheeses and, I believe, those selections will vary from day to day. My only nit with these two plates was that the serving staff was not yet well-versed in what was being served but that should come with time. The branzino was a work of art. Beautifully prepared and plated, cooked to perfection and served with an interesting array of roasted vegetables including baby carrots, turnips and black radishes it had a nice crispy crust on one side, and was soft and silky on the inside. 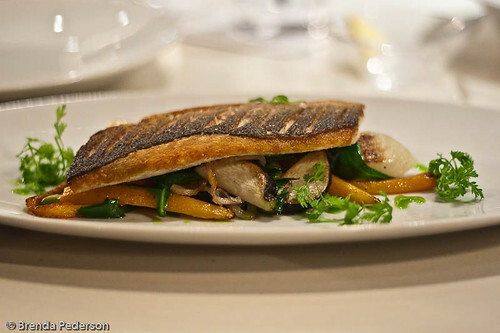 The branzino was on the dinner menu, not the Happy Hour menu. I have only one complaint about our experience at Mistral Kitchen. While sitting at the bar we were chatting with the two people working that night. At one point my wine glass was nearly empty and one person refilled it without asking if I wanted another glass. Now, this can be a common occurrence but normally when the bartender doesn’t ask if I want a refill I expect the glass is going to be comped, however this glass was added to my tab. Not a huge issue – it was Happy Hour, the price was low and I would have ordered another glass anyway but I think it’s bad bar manners to refill a glass without asking the customer if you plan to charge for it. And the person who did it is a seasoned bar professional who has worked at some of the nicer restaurants in town and should understand this nuance. Putting that aside, we enjoyed everything about Mistral Kitchen and will be back to really explore the menu in the future. And for those of you who appreciate finely crafted cocktails you’ll be happy to know that Andrew Bohrer, formerly of Naga in Bellevue, is directing the cocktail philosophy and menu. One quick note, Happy Hour really is happy hour. The specials are only available from 5:00pm – 6:00pm daily. So make sure you don’t miss it! 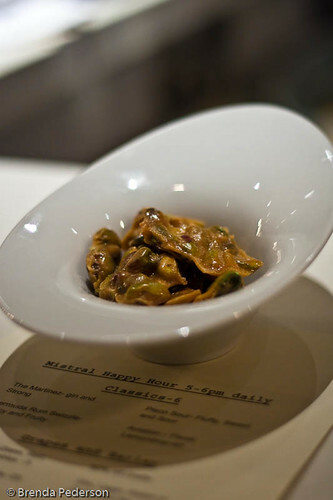 Update Jan 16: I returned to Mistral Kitchen last night with three friends. This was just short of 4 weeks from my first visit. Although I’m not ready to give up on them our experience was disappointing. The menu seemed rather scattered and was laid out in a way that made you have to interpret what were sides versus mains versus appetizers. They create daily menus but at 7:00 pm they were already out of a couple items and with a limited menu in the first place that’s an issue. There were a few shining stars in what we did order. A chicken liver mousse on the charcuterie plate was outstanding, as was a squash soup. The coq au vin was tender and gorgeous but seemed lacking in seasoning – something that would have made the difference between "good" and "wow!". But what really spoiled the evening was the service. Our server was distracted, unorganized and we never seemed to get her full attention. It took forever to get drinks. At one point 3 of 4 were delivered and several minutes later we had to remind her to get the final one. Assistants brought the wrong food to the table. There were many small slips that on their own wouldn’t have been distracting but when you string several together become a major influence. The bus boys, however, were great. I know this is still early so I won’t return for at least another month, hoping by then they have all the kinks worked out – in both the menu and the service.